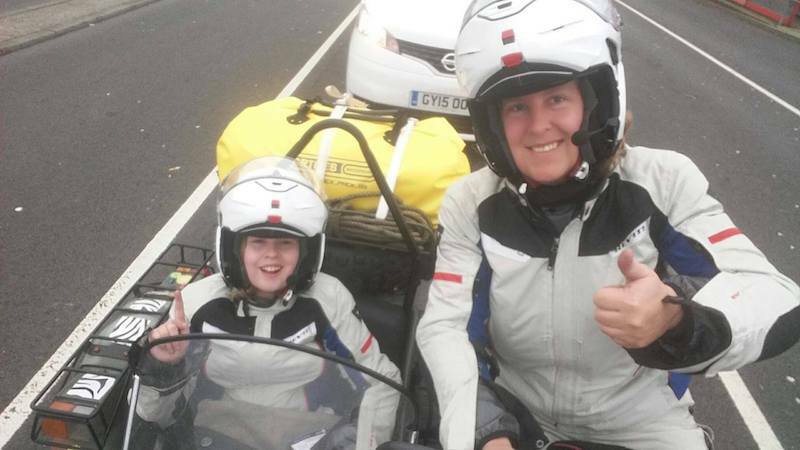 In November 2015, Melanie Cowpland and her 11-year-old daughter Sofia set off from the UK in a motorcycle and sidecar with one destination in mind – South Africa. 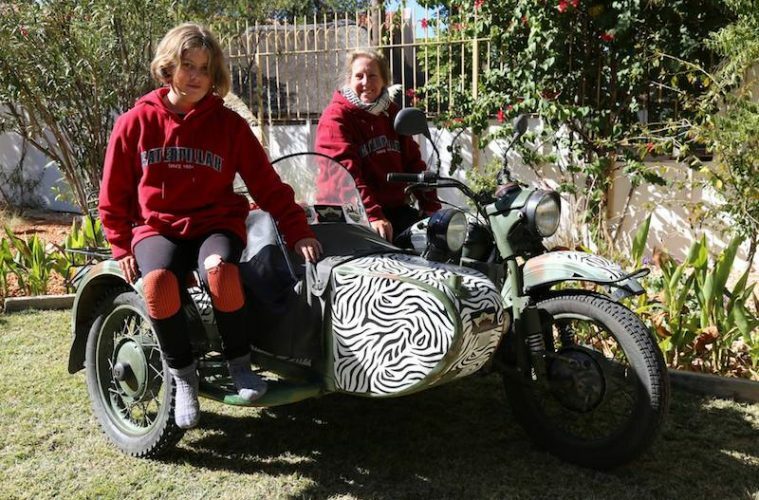 After spending nine months on the road, the duo had successfully completed their epic adventure, but what makes it all the more special is that the ride was designed by Melanie to help Sofia, who has autism, develop and see the world. ABR: Where did the idea of Africa with Autism come from? Melanie Cowpland: I love independent travel but hadn’t travelled since Sofia was two because it was too difficult with her autism. When she was eight, it became clear that she would be able to start coping, and a road trip in the summer then developed into a whole year as the timing was perfect for her school situation. 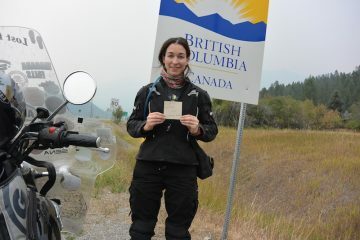 ABR: How much input did Sofia have in the planning and preparation for the ride? MC: She didn’t really input as she didn’t have the awareness. It was more a case of me selling it to her and then preparing her with as many ‘real case’ scenarios as possible, taking her on the bike camping for a weekend for example or, in the case of the European leg, I kept saying to her that the weather will probably be horrible but it is better to get through it quickly than keep stopping. I repeated this many times and, when it came to it, she was my cheerleader, keeping me going which was wonderful. The biggest prep for her was living in a caravan for four months before we left so that she was used to limited toys and no TV and internet. Thankfully, the bike broke down a few times before we left so she was used to that as well! 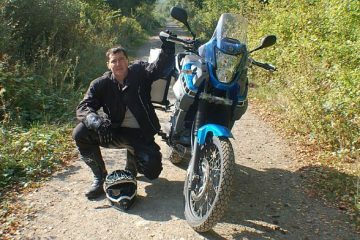 ABR: How much motorcycling experience did you have prior to the trip? 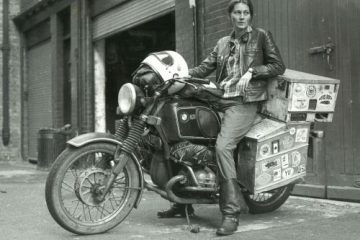 MC: I passed my test to do the trip, and I think I managed about 5,000 miles before we left, in between the bike being in and out of the work shop. 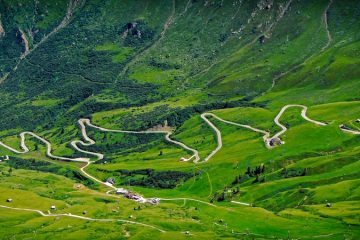 ABR: How did you decide on your route? MC: The safest route was the priority for me. Whilst I wanted to expose her to risk, I didn’t want it to be risk I couldn’t manage. The foreign office website was useful for this. 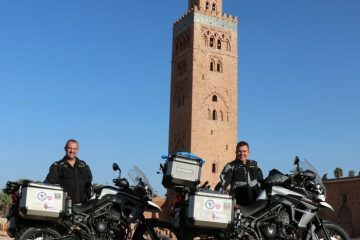 ABR: To many people, just the thought of riding through Africa is dangerous enough, but what was it like in reality from a safety point of view? MC: On the whole, the parts we visited were safe. 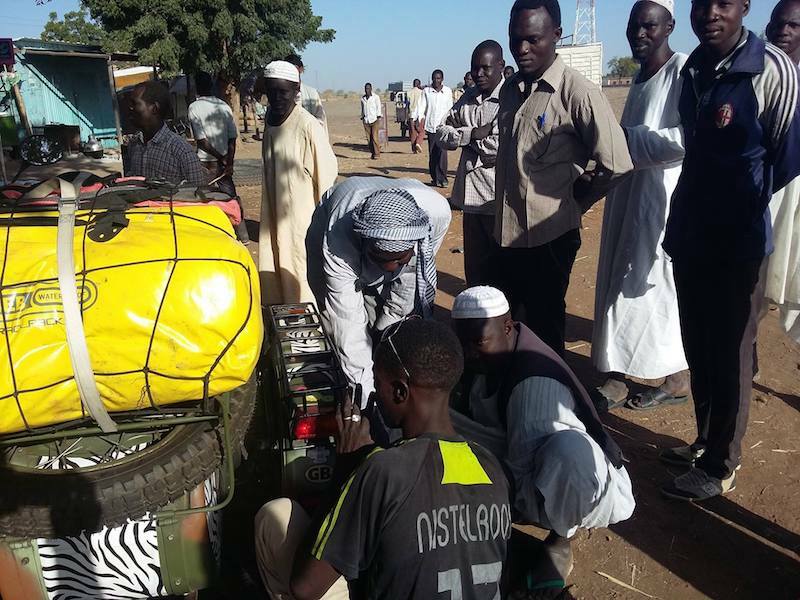 Most people in Africa are kind, helpful and friendly, and want you to have a good experience and be safe. Like everywhere in the world, including the in the West, there are people who are not nice, what is different about Africa is that the outcome of a simple robbery can be far worse. In terms of road conditions, I didn’t have any problems bar Cairo and Alexandria, but we were bigger than a solo bike and very noticeable. ABR: What was your most dangerous moment on the trip? MC: It was a very hot night in Tanzania and we couldn’t sleep so I decided we should get back on the road. I pulled over for a break and a cigarette about 3am and a police truck pulled in after us with about five men jumping out the back and a few from the front, and they clearly were up to no good. When I finally identified one in uniform I addressed him directly, at which point they realised I was a woman and I was travelling with a child. They were so shocked they forgot their intentions and started giving me safety advice on where better to park. After about a minute of this I then asked them to leave. This was a tense moment for me as they took about 30 seconds before visibly moving back to the truck. They jumped in and left. We didn’t hang around much longer in case they changed their minds! ABR: And your most memorable? MC: That’s a tough question – there are so many memorable moments to choose from! I think for me it has to be Sofia landing her first fish, a Middle Eastern tuna. She didn’t give up, even when her arms started hurting. It was a proud moment. For Sofia, at the moment it was the lava lake experience – she is just beginning to realise how big the effort was and the amazing support she got from the guides to get her through it. ABR: How was your trip received by the locals you met along the way? MC: Astonishment, shock, disbelief and inspired. A lot of people were surprised that it (the world) wasn’t as unsafe as they thought it was. As I was actually doing it, no one bothered with telling me I couldn’t, it was only in Zimbabwe when I was planning Mozambique, that people (men mostly) were trying to tell me I can’t and it was too dangerous. But it was clear that it was mostly hype. So, we went and, as it turned out, we didn’t go on the convoy for other reasons and the parts we did go were fine, despite constant rumours and paranoia. ABR: Which was your favourite country and why? MC: Another tough question! 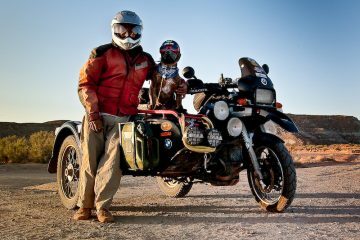 For me I think I enjoyed the deserts most in North Africa and Namibia because it felt more raw and untamed. For Sofia, it was southern Africa generally. I think that may have been because English was more readily spoken and swimming pools more abundant. ABR: I read on your blog about the Fanta challenge – can you explain to our readers what this fun little game was? MC: Keeping Sofia engaged on a goal that wasn’t about travel and tied her to home was important. This became Fanta. She liked the drink, so first I told her that it tastes much better out of a glass bottle, then someone said the grape flavour in South Africa was the best, then as we were on the journey it became about how many different flavours there were and whether she had tried them. It’s a bit like keeping yourself distracted by making words out of number plates, only designed for Sofia so she had meaning during the length of the journey itself. ABR: Before your ride there were many doubters, particularly when you attended a training course for riding the sidecar – did their doubt fuel you on, or did you start to have second thoughts? MC: The training was for overlanding generally (expectations, strategies etc.) as I understood it, but when we got there they made it all about off-road skills, I had hardly ridden the bike on road, let alone off-road, so it didn’t work out so well as a training day. 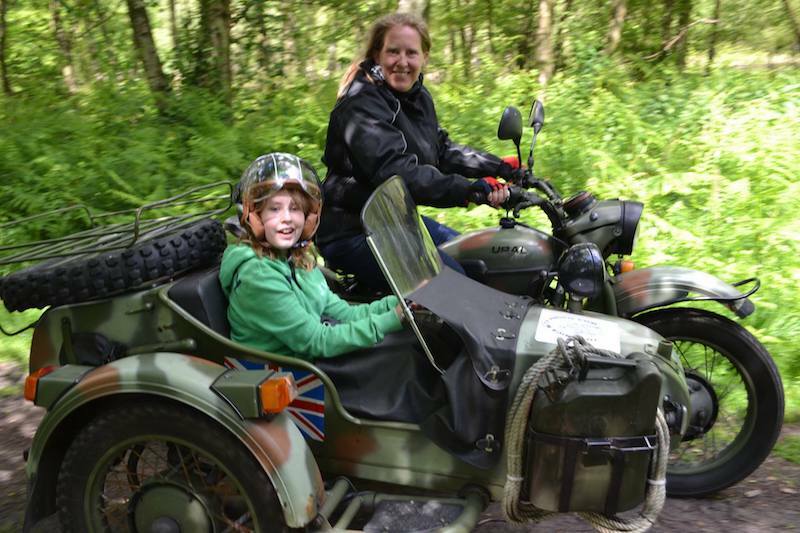 They didn’t have sidecar experience either, so I had invited my mechanic, who is very experienced with sidecars, to the training, to get that angle covered if it was needed. I was so glad he was there! Actually, their attitude just upset me. One of them, up until that point, had been supportive and helped with the planning, so to be confronted by the others in that way was shocking. I felt let down more than anything. I knew there would be people naysaying but it didn’t really factor in for me on whether or not to do the journey or fuel me on. My decision to do the trip had nothing to do with the opinions of people who don’t know me or have what I have in terms of experience and motivation to support me. It had everything to do with meeting Sofia’s needs – it was clear at the training that they had completely missed this point. The people who I felt best placed to offer an opinion that would affect my decision were supportive. ABR: How did the bike and sidecar perform on your ride? MC: At first it went well – but once we had the first major break down in Ethiopia we seemed to limp the rest of the way through Africa. ABR: Did you experience any mechanical difficulties along the way? How did you deal with them? MC: Two engine rebuilds, structural problems due to loss of a screw in the first case and too much weight on the punishing corrugated roads in Namibia in the second. We had a bad tank of fuel in Ethiopia, and for the rest of the trip the carbs seemed hypersensitive to ethanol – which isn’t great in a place like Africa. A new coil and a new interrupter were needed along the way as well. Thankfully all wheels were interchangeable, though, actually we only had one flat due to a loose spoke. 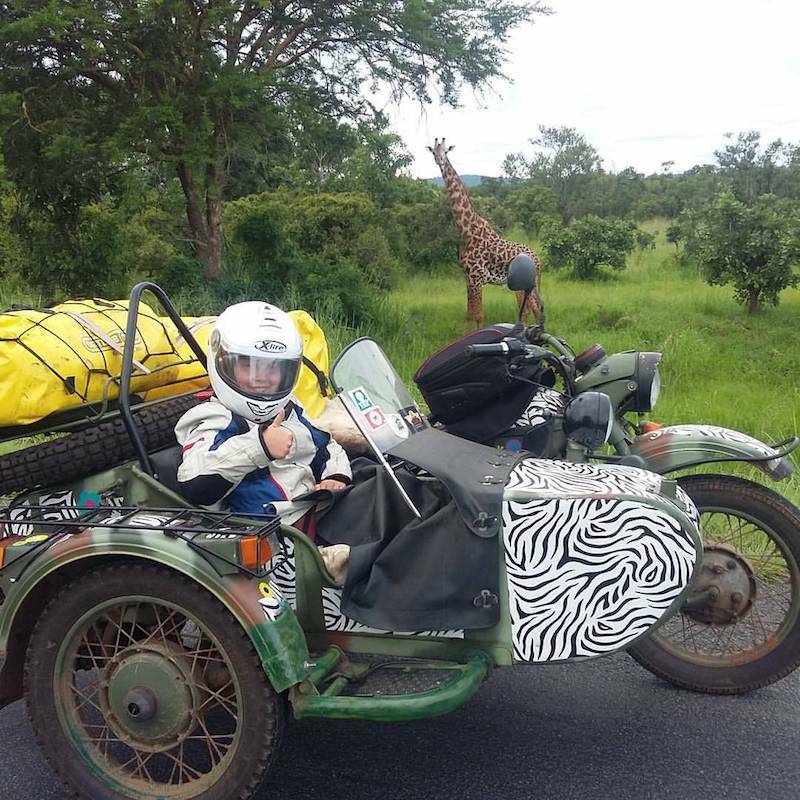 Dealing with issues was part of the adventure – in Africa there is always a plan and a coincidence, and amazing people getting you back on the road sooner than you think. ABR: What was the most rewarding part of the trip? 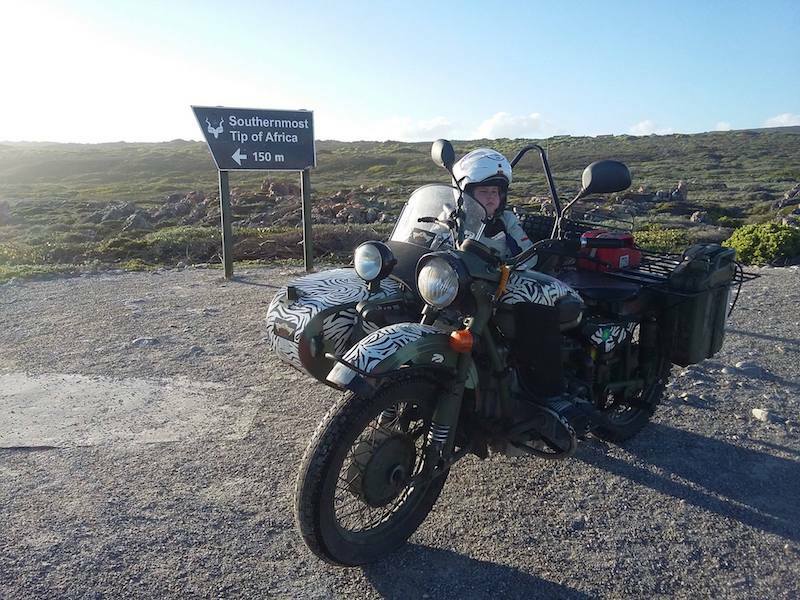 MC: Arriving in East London and South Africa, our end point, on the bike and not on a tow truck. ABR: Most importantly of all, did Sofia enjoy the ride? MC: Yes, she did. But getting a clear answer from her is not so easy. I think it will take years for her to process it all. Going out for a ride on the bike today is the only thing she doesn’t hesitate about though, so I know for certain it was a positive experience for her. ABR: What’s the next adventure for Melanie and Sofia Cowpland? MC: We have just completed a two-month tour in Europe which we have called The Crooked Foot Adventure. 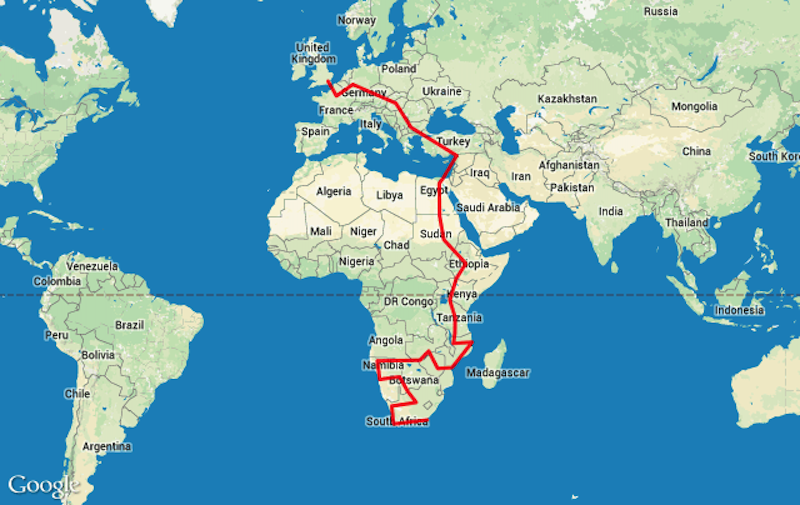 I would now like to finish the book on Africa, and possibly the Europe tour as well, before planning our next trip which will most likely be the USA. That said, who knows what the next year will bring! What I do know is that I want Sofia to be independent as an adult. With autism it could mean more thinking out of the box to help her to that end! To keep up to date with Melanie and Sofia’s rides, head to their website at www.adventurewithautism.org or follow them on Facebook and social media (/adventurewithautism).